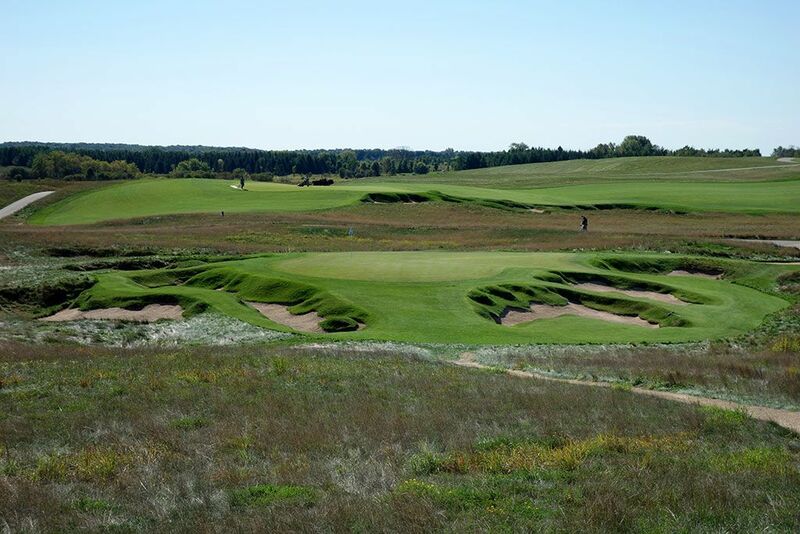 Course Website: Official Website - Visit Erin Hills Golf Course's official website by clicking on the link provided. 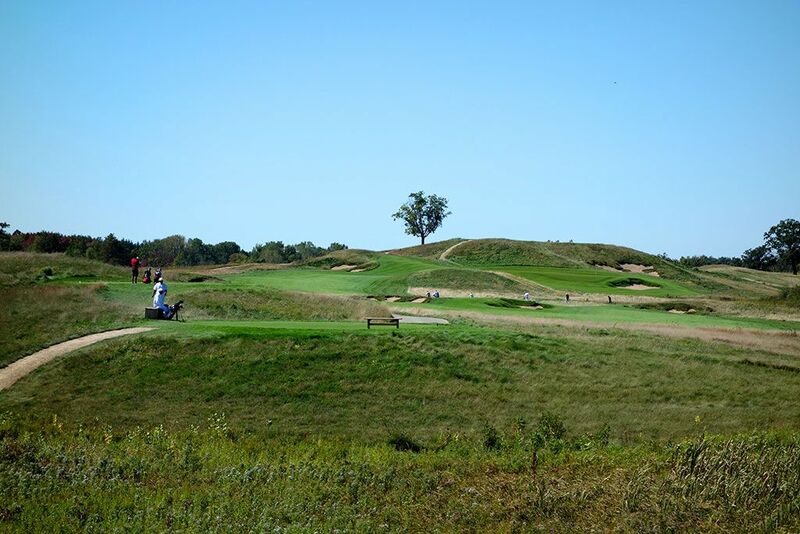 Accolades: Ranked 2nd in Wisconsin on Golf Course Gurus' Best in State list. 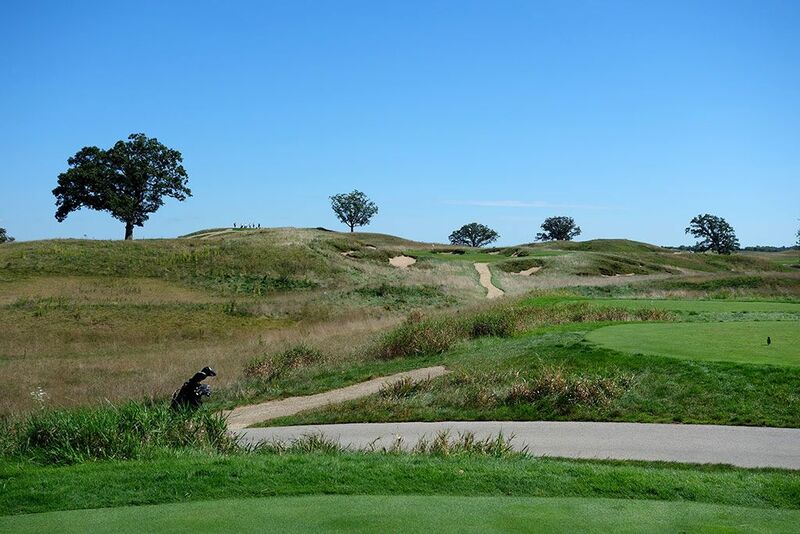 What to Expect: Located in former farming ground northwest of Milwaukee, Erin Hills enjoys exceptional terrain for inland links golf with rolling dune-like hills, golden fescue, and uninhibited views across the course highlighted by a few select trees. The theme of the course is drawn from Ireland with a clover logo, old world Irish countryside buildings, and a course that features a few blind shots and other architectural quirks. 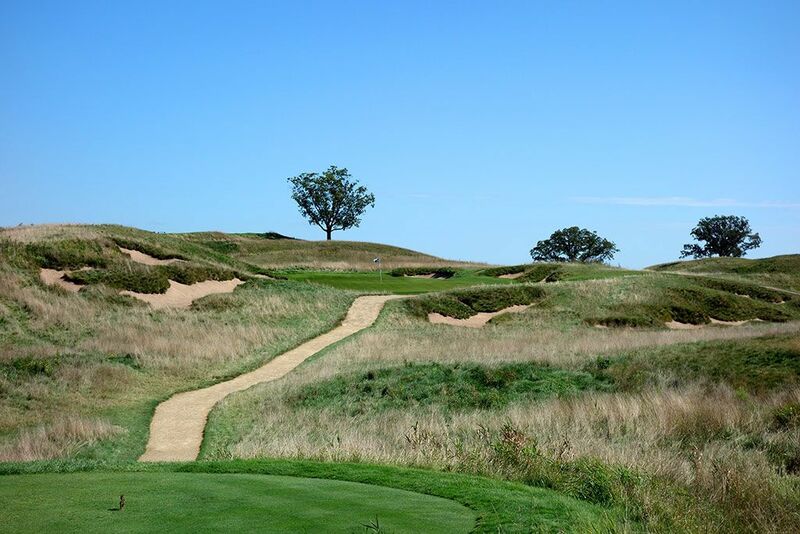 Erin Hills continues to hearken back to the roots of the game by requiring players to walk and take a caddie during their round which only adds to the overall experience and appreciation of the golf course. 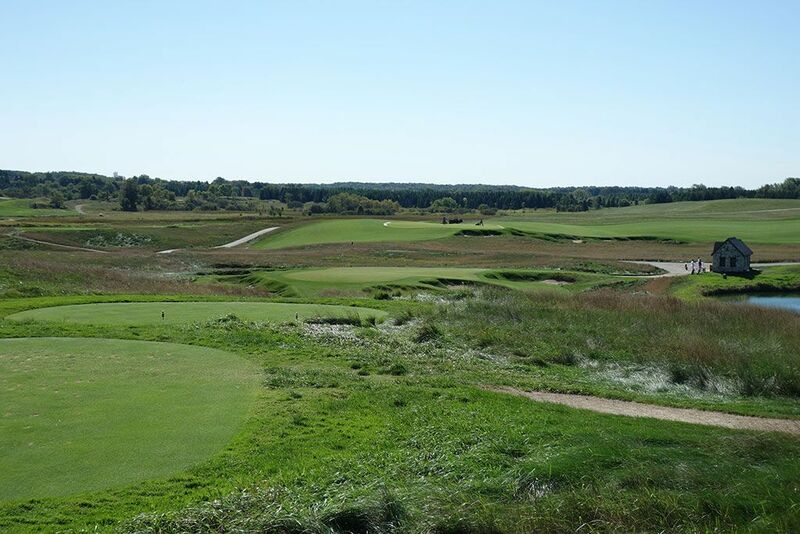 The fairways and greens play firm and fast, another must at a links course, which is can be handy when utilizing the course contours in the windy conditions that are often found at Erin Hills. 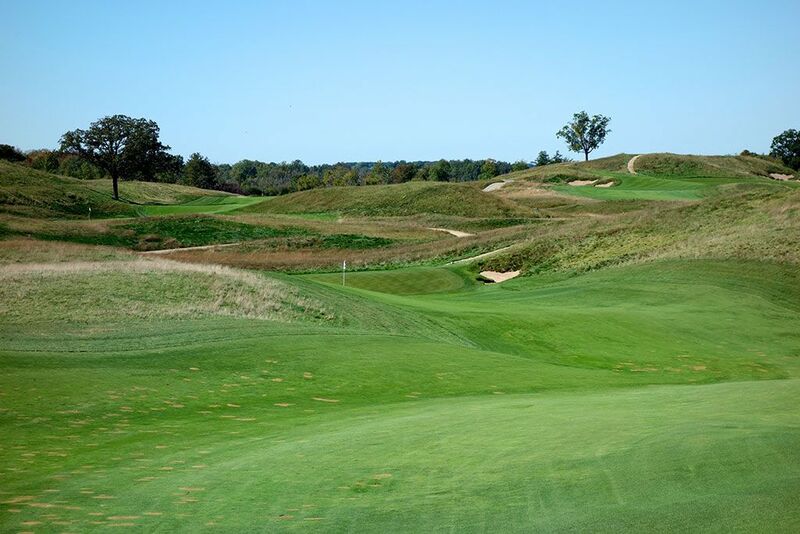 The inward nine trumps the front nine in terms of quality holes with an excellent variety of fun, challenge, and intrigue while finishing with one of the toughest holes in all of Wisconsin. 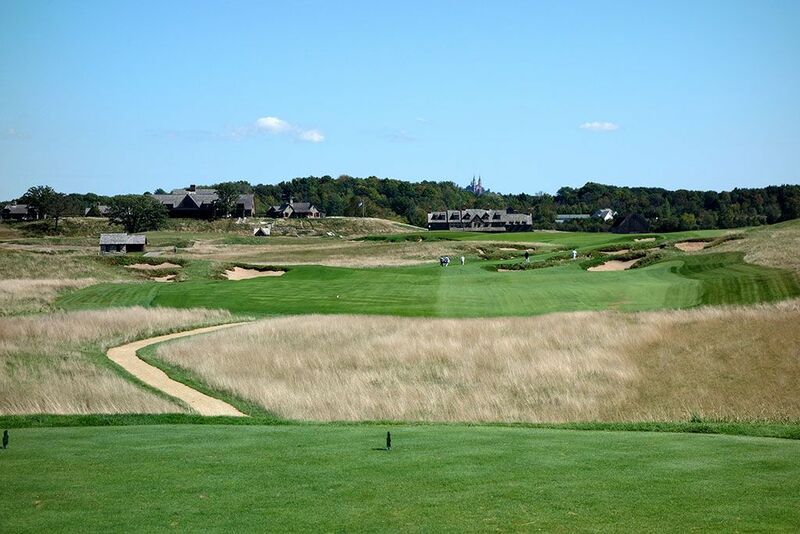 Course conditions are excellent and the width of the fairways paired with the size of the greens make the course very playable yet the architects manage to defend par expertly which will be evident during the 2017 U.S. Open. 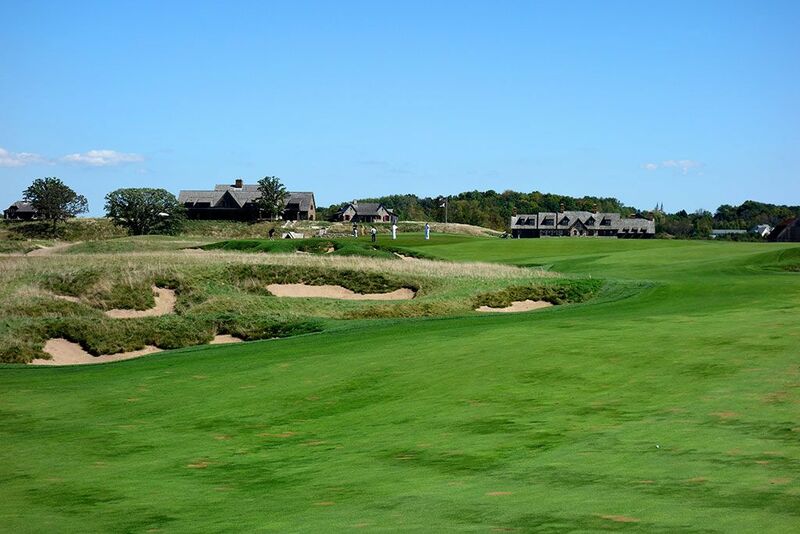 Signature Hole: 9th Hole – 165 Yard Par 3 – Erin Hills concludes the outward nine with a shortish par three that is a cross between a reverse Redan and a domed putting surface that is reminiscent of what you would find at Pinehurst No. 2. 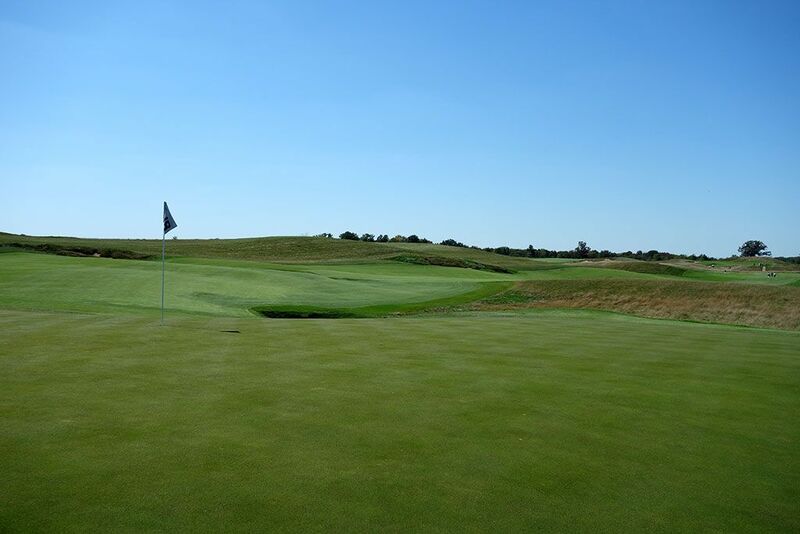 The green is virtually an island due to the amount of sand and fescue that surrounds it and the tee shot plays a bit downhill which can cause extra havoc when the famous winds are whipping through the course. With the putting surface sloping away in all directions, hitting your tee shot to the middle of the green is the smart play no matter where the flag is. Best Par 3: 16th Hole – 200 Yards – Another par three surrounded by trouble, the 16th sits down in a shallow bowl and plays a club uphill. Not only is part of the putting surface hidden from the tee, the bunkering just left of the green is also blind to the player and can catch some unassuming tee shots. The extra deep green can create some very challenging putting situations and a likely spot for a point to be won late in a match play competition. Best Par 4: 12th Hole – 466 Yards – The 12th hole represents perhaps the most memorable hole on a back nine that is packed with holes to remember. 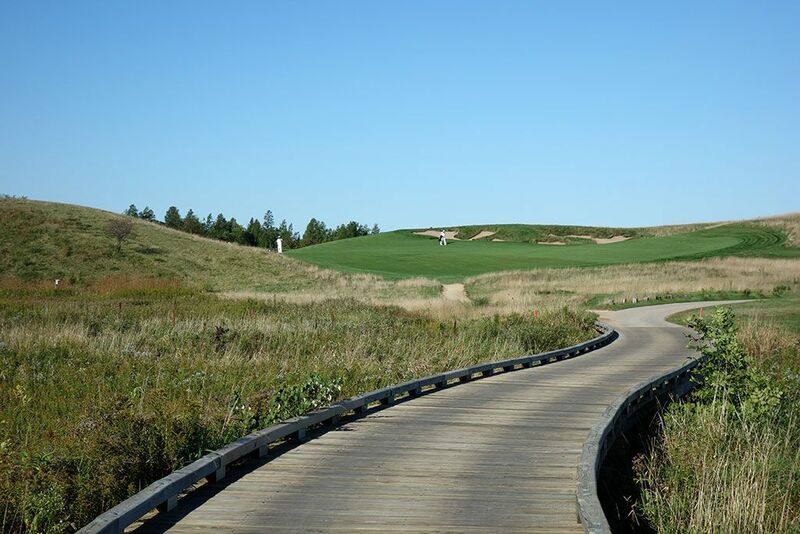 The natural terrain takes over at this double dogleg two-shotter that plays to a raised fairway before tumbling down between the adjacent hills creating a chute that will feed balls on to the green below. When the wind is in your face then reaching the crest of the hill may be difficult and thus making getting to the green in two highly unlikely however a tail wind can catch the fairway contours and leave a short bump and run shot to the flag. Best Par 5: 14th Hole – 609 Yards – This hole features perhaps the most unique green complex and set of challenges to contend with that I've ever encountered. The serpentine hole begins by playing out to the right where a pair of bunkers frame the landing zone. 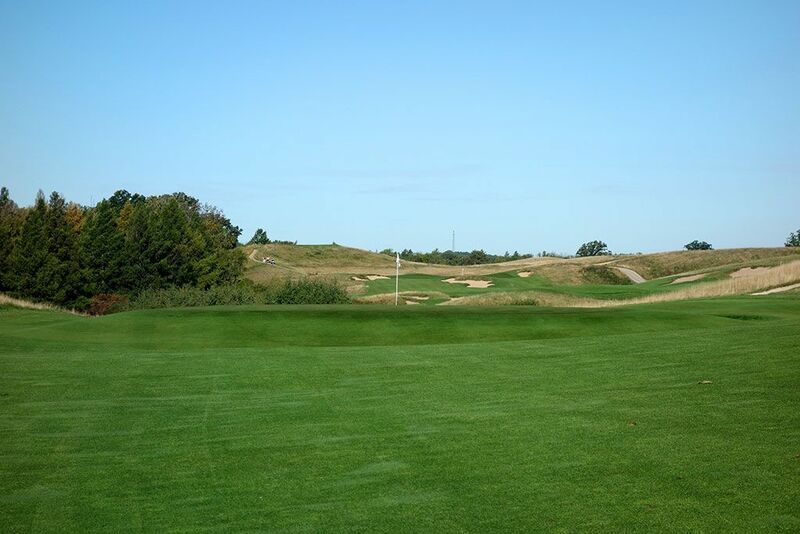 Golfers then have the option of laying up on the left side of the hole or taking a rip at the green over a large fescue field to a green featuring a large false front and a deep bunker short. Chipping from left of the green is a bear with a swell in front, a steep false edge on the right, and nothing but trouble long. 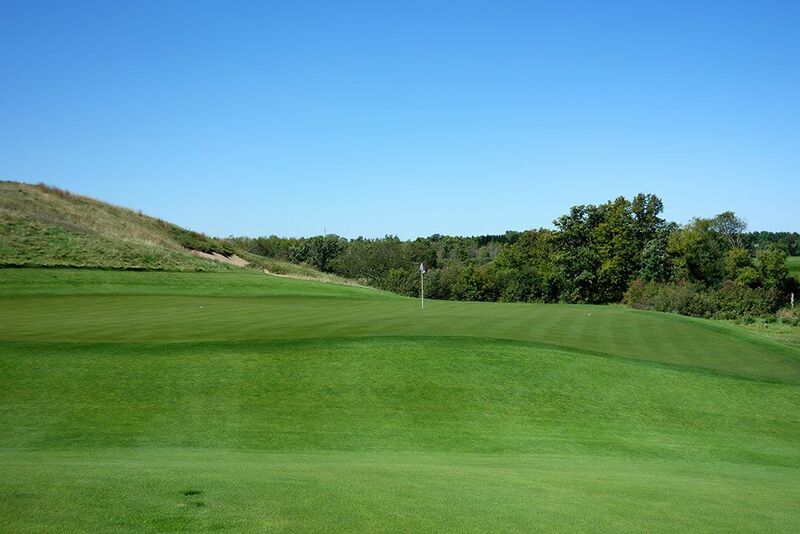 The severely sloped green will require creativity to conquer as players may be wise to utilize the back slope of the green in order to work the ball close to certain pin positions. More so than any hole on the course, this par five can yield the greatest spread of scores. Birdie Time: 2nd Hole – 363 Yard Par 4 – The designers try to bring some early variety into the layout by offering this short par four that can be driveable under the right circumstances. The green is blind from the tee with the large bunkered hill on the right being the main focal point. Tee shots that go just left of that hill can catch the necessary slopes to feed onto the green though the narrow opening and small green make it difficult to find the putting surface. 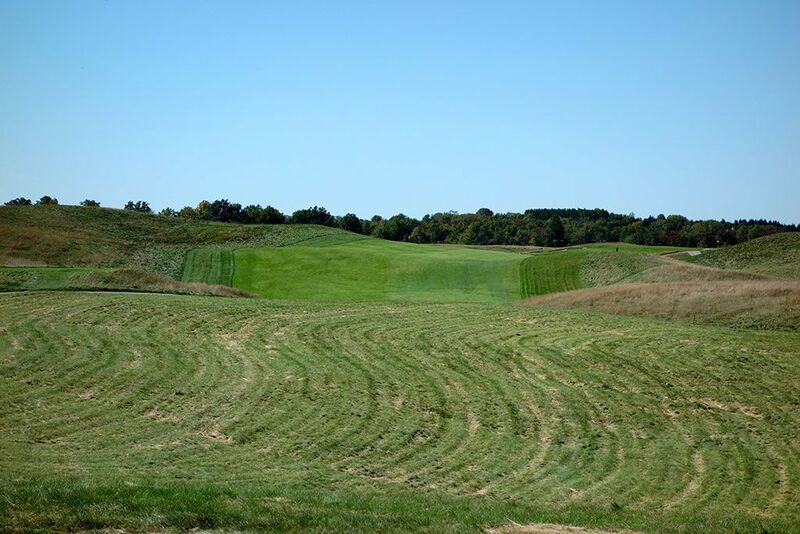 The safe play is over the hill on the left to a blind landing zone that yields the largest portion of fairway to hit before hitting a wedge into the green. Bogey Beware: 18th Hole – 660 Yard Par 5 – Playing into a head wind this hole is a brutal way to finish the round. At 660 yards you aren't getting home in two, with a head wind you may not get home in three. The hole is a late dogleg left that demands you don't cut off any yardage on the hole until your final approach to the challenging green. 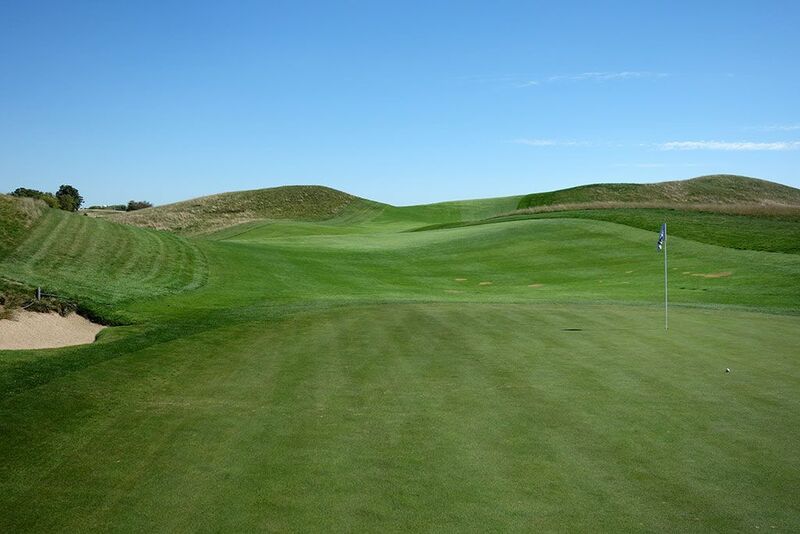 The putting surface is fronted by raised bunkers and the slope of the green to the left feeds balls into the fescue with no regard of your desire to finish on a good note. 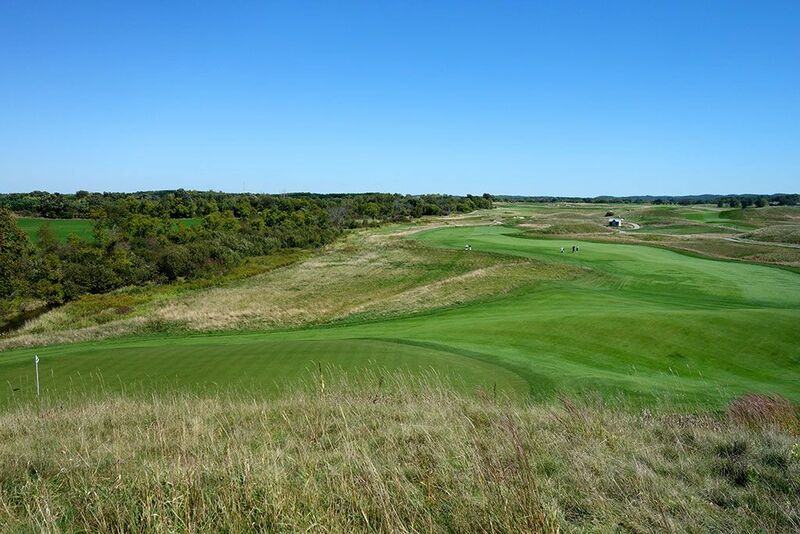 The slope on the right side of the green makes playing in from the safe side of the fairway no gimmie as Erin Hills demands you to be on top of every aspect of your game to the bitter end.